Upon its liberation in 1945 and subsequent foundation in 1948, North Korea adopted national symbols distinct from the national symbols of South Korea. The traditional flag of Korea, the Taegukgi, and the symbol Taeguk, were swapped for communist symbols. Some of the symbols of North Korea – the national emblem, flag, anthem and capital – are defined in the constitution of North Korea, while others such, as the national sport Ssirŭm or the national dish kimchi, are traditional. Some traditional symbols are shared with the South but with different connotations. Mount Paektu, for instance, is recognized as the symbol of Korea across the peninsula, but North Koreans revere it as the birthplace of Kim Jong-il. Some North Korean symbols are complemented with symbols for the ruling Kim family. For example, the Magnolia sieboldii is the national flower but the hybrid orchids Kimilsungia and Kimjongilia are also respected. Chapter VII of the Socialist Constitution of the Democratic People's Republic of Korea defines the emblem, flag, anthem and capital of North Korea, while the head of state is stipulated by article 117 of chapter VI. The emblem of North Korea features Mount Paektu, itself an important symbol of Korea. 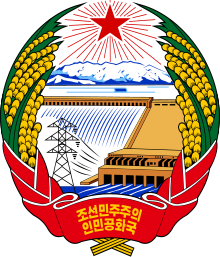 The national emblem of the Democratic People's Republic of Korea bears the design of a grand hydroelectric power station under Mt. Paektu, the sacred mountain of the revolution, and the beaming light of a five-pointed red star, with ears of rice forming an oval frame, bound with a red ribbon bearing the inscription "The Democratic People’s Republic of Korea." The colors of the flag of North Korea are also its national colors. The national flag of the Democratic People's Republic of Korea consists of a central red panel, bordered both above and below by a narrow white stripe and a broad blue stripe. The central red panel bears a five-pointed red star within a white circle near the hoist. The flag of North Korea was designed in 1948 and adopted the same year to replace Taegukgi, the traditional flag. The Taeguk symbol that now remained in the flag and emblem of the South was subsequently removed from North Korean photos and texts. The colors of the North Korean flag – red, white and blue – are considered national colors and symbolize respectively: revolutionary traditions; purity, strength, and dignity; and sovereignty, peace, and friendship. The national anthem of the Democratic People's Republic of Korea is "The Patriotic Song." The national anthem is "Aegukka" (Korean for The patriotic song), written by Pak Se-yong and composed by Kim Won-gyun in 1946. Musically, it is similar to South Korea's national anthem, spelled "Aegukga". In addition to "Aegukka", the "Song of General Kim Il-sung and "Song of General Kim Jong-il" play an equally important role. The folk song "Arirang" is known as the "unofficial national anthem of Korea". North and South Korea have submitted it separately to UNESCO's Representative List of the Intangible Cultural Heritage of Humanity. The capital of the Democratic People's Republic of Korea is Pyongyang. The first 1948 constitution defined Seoul – the present capital of South Korea – as the capital city. In order to have succeeded in realizing this, the South Korean regime would have had to be removed. In 1972 the constitution was revised and Pyongyang designated as the capital. The President of the Presidium of the Supreme People's Assembly represents the State and receives the credentials and letters of recall of diplomatic representatives accredited by foreign countries. The head of state of North Korea has been the President of the Presidium of the Supreme People's Assembly since 1998. The post has been held by Kim Yong-nam since then. Magnolia sieboldii, the national flower, is known as "mokran" in North Korea. North Korea has no official national animal, but the mythological winged horse Chollima is taken to be a national symbol. North Korean Siberian tigers are considered unofficial symbol of both Koreas as it represent the Korean people and nation. The national dog is the Pungsan dog. Pungsan is named after what was once Phungsan County (now Kimhyonggwon County) in Ryanggang Province. It has been bred as a hunting dog. Recently, efforts to conserve and proliferate the breed have been taken. The national bird is the northern goshawk (Accipiter gentilis). The bird inhabits the northern and central parts of the peninsula and sometimes migrates to the southern part of the country in winter. Historically, Koreans have used the goshawk to hunt pheasants, pigeons and hares. The national flower is the Magnolia sieboldii. It was originally called "hambak" in Korean but was renamed "mokran" after the suffix "-ran" given to beautiful flowers in Korean. The act of renaming is attributed to Kim Il-sung. Two orchid hybrids are also significant: Kimilsungia and Kimjongilia. They are both considered unofficial national flowers. The national tree is pine (Pinaceae). Pines are considered beautiful aspect of scenery and have been featured in Korean visual arts since ancient times. Pine trees are associated with Kim Il-sung's guerilla activities in the forests around Mount Paektu, and thus with the founding of the country. Earlier, Kim Hyong-jik, the father of Kim Il-sung, had composed a poem: "Green Pine on Nam Hill" to promote liberation of the country. The national day on 9 September is the Day of the Foundation of the Republic, a public holiday that commemorates the date when Kim Il-sung appointed a cabinet in 1948. Both the birthplace of Kim Il-sung at Mangyongdae and the Juche Tower are considered national monuments. The national dish is kimchi, a spicy, fermented vegetable dish. North Korean kimchi tends to be less spicy than its Southern counterpart. Both are inscribed on UNESCO's Representative List of the Intangible Cultural Heritage of Humanity. The traditional Chosŏn-ot (hanbok) is the national dress. The national sport is Ssirŭm, traditional Korean wrestling, but the martial art Taekwondo is important, too. Kim Il-sung, founder and president of the modern North Korean state and his successor Kim Jong-il are considered national heroes if not personifications. Mount Paektu is recognized as a symbol of Korea in the North and South alike, but North Korea has attached special significance to it by claiming that it is the birthplace of Kim Jong-il. Tangun, who is considered the founder-king of the Korean nation, is also said to be born at Mount Paektu and is celebrated in North Korea especially. In 1993 North Korean archaeologists located and dated remains in a tomb that they declared Tangun's grave. ^ a b c d e f Socialist Constitution of the Democratic People's Republic of Korea (PDF). Pyongyang: Foreign Languages Publishing House. 2014. ISBN 978-9946-0-1099-1. Archived from the original (PDF) on 8 June 2016 Amended and supplemented on April 1, Juche 102 (2013), at the Seventh Session of the Twelfth Supreme People's Assembly. ^ a b Tertitskiy, Fyodor (23 September 2014). "The Evolution of North Korea's Coat of Arms". Daily NK. Retrieved 30 September 2015. ^ a b Tertitskiy, Fyodor (20 June 2014). "Kim Tu Bong and the Flag of Great Extremes". Daily NK. Retrieved 30 September 2015. ^ a b Pratt, Keith (2007). Everlasting Flower: A History of Korea. London: Reaktion Books. p. 33. ISBN 978-1-86189-335-2. ^ Hoare, James E. (13 July 2012). Historical Dictionary of Democratic People's Republic of Korea. Plymouth: Scarecrow Press. p. 273. ISBN 978-0-8108-7987-4. ^ Lankov, Andrei (24 April 2007). North of the DMZ: Essays on Daily Life in North Korea. McFarland. p. 38. ISBN 978-0-7864-5141-8. Retrieved 25 April 2015. ^ a b "N. Korea's Arirang wins UNESCO intangible heritage status". Yonhap. 27 November 2014. Retrieved 25 November 2015. ^ Eberstadt 1999, p. 26. ^ Eberstadt 1999, p. 32. ^ Cha & Hwang 2008, p. 198. ^ Foran 2013, p. 132. ^ "Horang-i" 호랑이 [Tiger]. Encyclopedia of Korean Culture (in Korean). Retrieved 8 January 2010. ^ Kang 2015, p. 27. ^ "Protection of Goshawk Active in DPRK". Naenara. KCNA. 5 March 2016. Retrieved 6 March 2016. ^ "Goshawk, National Bird of Korea". kcnawatch.nknews.org. Korean Central News Agency. 21 April 2014. Retrieved 22 September 2015. ^ Lim, Reuben C. J. (29 June 2013). "Floral Emblems of the world". anbg.gov.au. Australian National Herbarium. Retrieved 9 September 2016. ^ "National Flower of the DPRK". Naenara. Retrieved 19 November 2015. ^ Foran 2013, p. 38. ^ Minahan 2010, p. 82. ^ "North Korea Newsletter 360 (April 30, 2015)". Yonhap News Agency. 30 April 2015. Retrieved 22 September 2015. ^ Han Su-yong (2016). Understanding Korea 3: Politics (PDF). Pyongyang: Foreign Languages Publishing House. ISBN 978-9946-0-1406-7. ^ a b "Pine Tree Symbolic of Spirit of DPRK". web.archive.org. KCNA. 24 April 2015. Archived from the original on 7 July 2015. Retrieved 22 September 2015. ^ Zhiqun Zhu, ed. (2012). New Dynamics in East Asian Politics: Security, Political Economy, and Society. New York/London: Continuum. p. 265. ISBN 978-1-4411-6621-0. ^ Tertitskiy, Fyodor (9 September 2015). "The Soviet strategy behind NK's Foundation Day". Daily NK. Retrieved 30 September 2015. ^ Cornell, Erik (2005). North Korea Under Communism: Report of an Envoy to Paradise. Translated by Rodney Bradbury. London: Routledge. p. 123. ISBN 978-1-135-78822-3. ^ Lerner, Mitchell (2008). "Making Sense of the 'Hermit Kingdom': North Korea in the Nuclear Age". Origins. 2 (3). Retrieved 5 October 2015. ^ Becker, Jasper (2005). Rogue Regime : Kim Jong Il and the Looming Threat of North Korea: Kim Jong Il and the Looming Threat of North Korea. USA: Oxford University Press. p. 121. ISBN 978-0-19-803810-8. ^ "North Koreans Want UNESCO Recognition for Their Kimchi Variation". YouTube. 1:10: Voice of America. 2 December 2015. Retrieved 3 December 2015. ^ "UNESCO Adds N. Korea's Kimchi-Making to Cultural Heritage List". KBS. 3 December 2015. Retrieved 3 December 2015. ^ French, Paul (2007). North Korea: The Paranoid Peninsula: A Modern History, Second Edition (2 ed.). London / New York: Zed Books. p. 42. ISBN 978-1-84277-905-7. ^ Behnke, Alison (2005). North Korea in Pictures. Twenty-First Century Books. p. 117. ISBN 978-0-8225-1908-9. ^ Minahan 2010, p. 84. Victor D. Cha; Balbina Y. Hwang (2008). "Government and Politics". In Worden, Robert L. (ed.). North Korea: A Country Study (PDF) (Fifth ed.). Washington: Government Printing Office. pp. 181–234. ISBN 978-0-16-088278-4. Eberstadt, Nick (1999). The End of North Korea. Washington: American Enterprise Institute. ISBN 978-0-8447-4087-4. Foran, Racquel (2013). North Korea. Minneapolis: ABDO Publishing Company. ISBN 978-1-61480-875-6. Kang Su-jong (2015). "Symbols of Korea" (PDF). Korea Pictorial (4): 26–27. ISSN 1727-9208. Archived from the original (PDF) on 4 March 2016. Minahan, James (2010). The Complete Guide to National Symbols and Emblems. 1. Satna Barbara: ABC-CLIO. ISBN 978-0-313-34497-8. Choe Yong-thae (2018). A Grand Birth (PDF). Translated by Kim Myong-chan. Pyongyang: Foreign Languages Publishing House. ISBN 978-9946-0-1724-2. Hong Kyong-sik (1992). Magnolia Sieboldii : Korea's National Flower (PDF). Pyongyang: Foreign Languages Publishing House. OCLC 52473426. So Yong-il (2010). Ri Sun-yong (ed.). Kimchi : Korean Speciality (PDF). Pyongyang: Foreign Languages Publishing House. ISBN 978-9946-0-0521-8. Wikimedia Commons has media related to Symbols of North Korea. This page was last edited on 5 October 2018, at 13:06 (UTC).